Speightstown a “Good Value Sire” for All: If you follow this Stallion Feature series of mine, you will already have read about the top three sires on the General sires list, thus far in the year. If we follow my pattern, the number four stallion should be next. If you all follow the list, you should know who I am talking about. 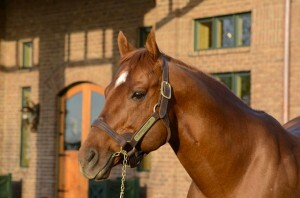 If you do not, let me introduce you to top stallion, Speightstown! Speightstown was not let down as a racehorse. When he was purchased for $2 million dollars, there was a lot riding on him to be successful. He did not disappoint. He finished his career with a 16-10(5)-2-2 race record. Speightstown was not let down as a racehorse. When he was purchased for $2 million dollars, there was a lot riding on him to be successful. He did not disappoint. He finished his career with a 16-10(5)-2-2 race record. His major accomplishments came in his six-year-old year, when he competed in, and won, the Artax H., Vanderbilt H., True North H., Churchill Downs H., and the Breeders’ Cup Sprint. He retired with over $1.2 million in earnings, and that may seem less than amazing, due to his high purchase price, but Speightstown was just getting started! In his career at stud, WinStar Farm’s Speightstown has 9 crops total, with 7 of racing age. With 734 registered foals, Speightstown has not disappointed a single year he has been at stud. He has been in the top 5 stallions every season he has been producing. This year alone, he has 92 registered two-year-olds. That brought his total count of registered offspring to 734. With these numbers, how can he not be worth the $80,000 that WinStar is standing him for? Speightstown has produced, thus far, 1 champion, 23 grades stakes winners, and 58 stakes winners. 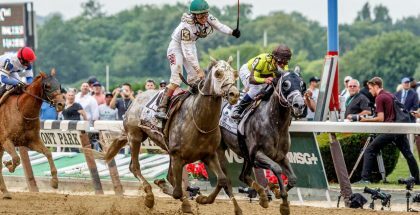 Names that should be easily recognizable would be Golden Ticket (2012 Travers winner), Seek Again (2014 Fourstardave winner), Haynesfield (2010 JCGC winner), Jersey Town (2011 Cigar Mile winner), and Fast Bullet (2013 True North winner). Speightstown is on his way to the top, and quickly. He has shown he is a very versatile and worth-it sire. He has sired sprinters, milers, and classic horses. For $80,000, Speightstown is ranked in the top “Good Value Stallions” and he easily shows us why is such a good value. His son Seek Again has exploded onto the turf mile scene this year, and it is hard to ignore the sire of a good horse. We have to look deeper and maybe, we will understand why Speightstown is a good stallion, but for now, let’s enjoy his rise to the top.